Banana Distributors received the award for “Most Progressive Supplier of the Year” for fresh produce in the Western Cape from Pick ‘n Pay on Friday night at an award ceremony held in Johannesburg. 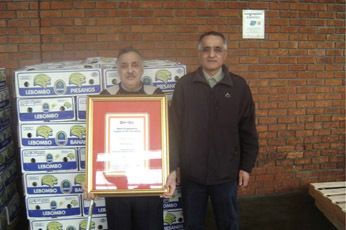 The award was presented to the owner of Banana Distributors, Mr Sulaiman (Solly) Allie, at a ceremony Monday at the Cape Town Market on 22nd September. Banana Distributors won 1st prize while competing against approximately 300 fresh produce suppliers to Pick ‘n Pay in the Western Cape. 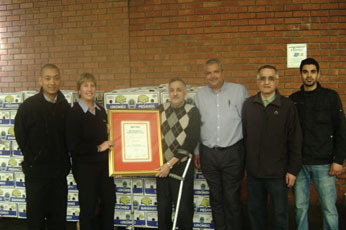 Banana Distributors has been operating from the Cape Town Market since it opened its doors in 1961, supplying many retailers and smaller buyers in the Western Cape. Banana Distributors has been supplying Pick ‘n Pay with bananas for the past 30 years and has built up a strong banana wholesale business. The Cape Town Market is proud to be associated with Banana Distributors and congratulates them on this prestigious award and wishes them further success for the future.